Inside São Paulo: World Naked Bike Ride 2010 - Sao Paulo edition. Four people were arrested. World Naked Bike Ride 2010 - Sao Paulo edition. Four people were arrested. The third edition of the Brazilian World Naked Bike Ride (Pedalada Pelada in Portuguese) that happened on Saturday (2010, March 13th), in Sao Paulo, ended with the arrest of at least four riders. According to estimates provided by the military police, 80 people was part of the act, among participants wearing bathing suits and some of them completely naked. The manifesto that was scheduled to start at 2pm at the corner of Avenida Paulista and Av. Consolação, was extended to other places of the city. At about 4pm, next to the street Avanhandava, central region of São Paulo, two of them were detained by police for disrespecting authority. Soon after that, other riders tried to stop police arresting the cyclists. Spray tear gas and batons were used to "contain the most exalted ones." Two female cyclists, Laura Sobenes Sono and Talita Noguchi, were also taken to the police station and were fined for obscene act. 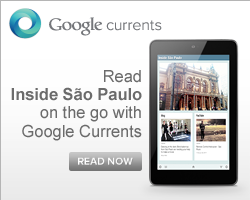 "The outbreak could have been just on Avenida Paulista, as previously agreed, but the agreement was breached." Said the sergeant Fernando Souza, who was not able to specify who had made the agreement. The World Naked Bike Ride is a peaceful protest that happens in dozens of cities around the world. Its main objective is to defend the inclusion of the bicycle as a transport way around the city, and denounce the pollution caused by automobiles.